Yesterday I had the good fortune to be the keynote speaker at the Winter Symposium on Digital Literacy in Higher Education at the University of Rhode Island. It was incredibly energizing to spend a day and a half with a diverse group of educators across disciplines, all of them committed to the idea that improving our students’ (and our colleagues’) digital literacy. Of course, there are few more amorphous topics than digital literacy, which made my task as keynote speaker challenging, to say the least. A quick survey of the literature yields almost as many definitions of the concept as there are authors who write about it. Do we mean the ability to use digital technologies to accomplish a particular task? Or does it mean just being able to navigate the wilds of the Internet without being taken in by the false information floating around out there? Or does it mean being able to create digital objects, code something useful, or develop visualizations of large corpora of texts? 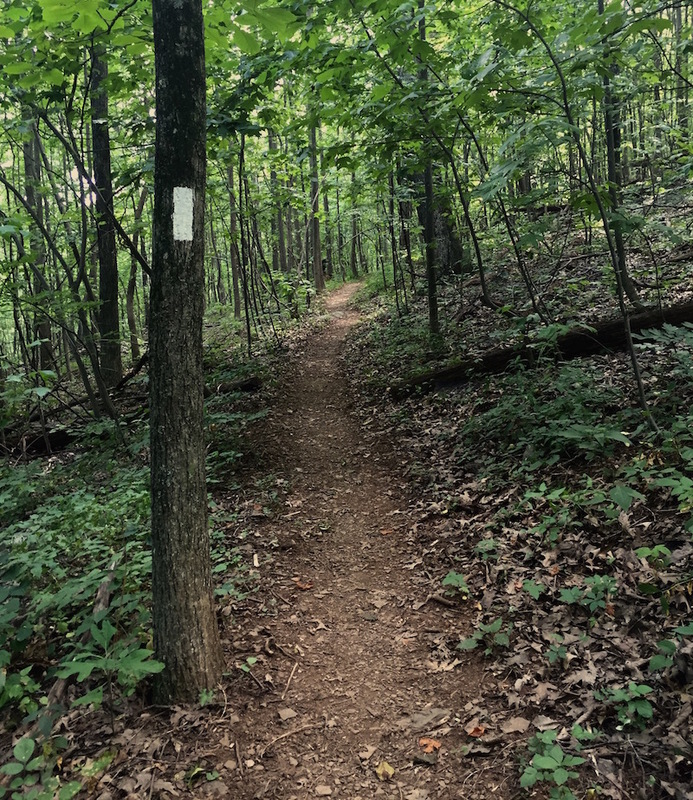 To help those assembled to try to find a way forward, I drew on my experiences on the Appalachian Trail, America’s oldest and still most iconic long distance hiking trail. Of late I’ve been mesmerized by Robert Moor’s On Trails (2016). Moor writes in ways I can only dream about, and in his first pages I found the quotation that I think helps us make our way through the echoing vastness of the Internet. If we think about digital literacy more as choosing a path through the mountains and less like trying to sail across the open ocean, then I think we have a chance to find a way forward as educators and as scholars. Of course, paths impose their own tyranny. Early into their hikes, long distance hikers find themselves less and less willing to leave the path marked out for them by others. Ask anyone who has through hiked the Appalachian Trail and they’ll tell you that “Blue Blazer” is a term of derision, because it connotes that long distance hiker who leaves the white blazes of the AT for side trail short cuts with blue blazes on the trees and rocks. Despite the risk of being labeled a Blue Blazer, I think we have to admit that there are too many options, too many platforms, too many apps, too many new ways to navigate the Internet. If we accept this premise, then instead of trying to define or to teach something called “digital literacy,” we can instead decide “I’ll just do this,” or, “I’ll just teach my students that.” And not anything else. Do we do them or ourselves a disservice by ignoring so much? My answer is no. Too often we forget that our students are with us for only a short time in what we (and they) hope are long and productive lives. Instead of teaching them everything they need to know about things digital, it strikes me as more than enough to teach them a few useful skills, a few useful ways of knowing. We need to give them the tools to find their own paths, and we need to model the willingness to reject the notion that to be competent means always being able to do more and more. Sometimes enough is plenty. Just a little over 100 years ago, Benton MacKaye stood in a fire tower in Vermont and gazed out over the beauty of the Green Mountains. It was there that he first dreamed up a thing he later christened the Appalachian Trail. MacKaye’s mantra for those hiking on the trail he created was “Walk, see, and see what you see.” To put it another way, stop, look around, what can I see/learn here. Stopping is a risk, because in doing so, the Internet will swoosh past us. But that’s ok. Really. This entry was posted in Posts and tagged appalachian trail, digital literacy, students, teaching on January 14, 2017 by Mills.